The Hallicrafters SX-28 is just a gorgeous vintage radio. There isn’t another vacuum tube communications receiver in my collection that really provides a better “glow in the dark” feeling than this one. 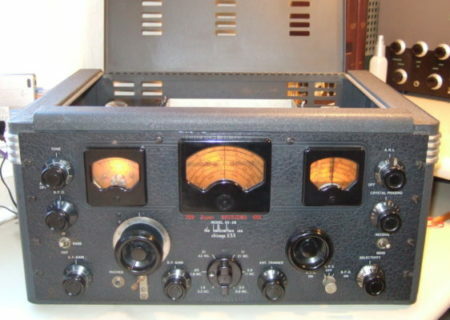 The SX-28 is undoubtedly Hallicrafters’ finest pre-World War II radio (excluding Hallicrafter’s special dual diversity DD-1). This radio came from the era in which the “boatanchor” moniker was born. The SX-28 is a well engineered and heavy single conversion broadcast and HF receiver offering coverage from .55 to 42 MHz in 6 bands. Many of these saw service during the War, both in active duty as well as clandestine applications. 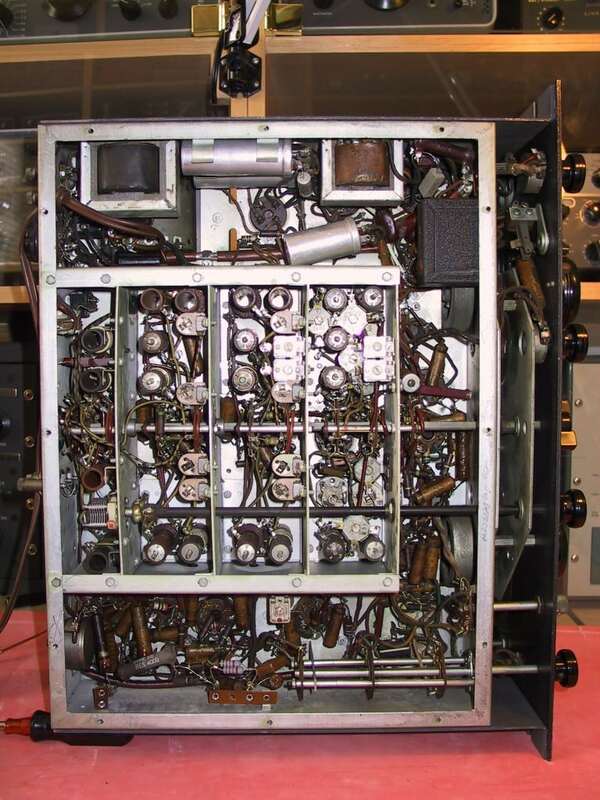 The Radio Intelligence Division (RID) of the FCC and the Foreign Broadcast Intelligence Service (FBIS ) used these during the War to monitor enemy communications for American intelligence agencies. Many good restoration articles have been written about this radio, so this article won’t repeat much of the information presented by those authors. Most of these articles, which you can easily find on Google, will tell you that the SX-28 is not an easy radio to rebuild and align. To an extent they’re right. If you are a novice restorer, you would certainly be better off honing some basic skills before tackling a beast like this. This radio is full of paper capacitors that should all be replaced, and many are located in extremely tight areas that are difficult to even see, much less reach with a soldering iron and hemostats. On the other hand, if you are methodical and crafty, the radio easier to restore than many of these articles suggest. Many restorers present various techniques for disassembling the RF cage so you can more easily reach components. The daunting nature of this task put me off, as only rarely do I have the luxury of spending that much time on any one restoration. The more I studied each component to be replaced in the RF deck, the more the task convinced me that with judicious removal of a wire here and there–perhaps unmounting an occasional trimmer capacitor–every component could be replaced. The good news is that a crafty and inventive replacement techniques worked even better than expected. So don’t be put off by thinking you’ve got to disassemble the RF deck to restore this radio. The audio output stage uses push-pull 6V6 tubes and is known for good sound on AM broadcast. The distortion is audibly higher many people would like, but a few slight modifications would probably improve the distortion figure substantially. Maybe someday I’ll look into the issue and publish the results. As you can see, the 4 sections of the RF deck in the middle of the chassis are very crowded. Follow the factory manual’s alignment instructions, and you won’t get into trouble. Only once did I have a problem aligning one of the band oscillators. I discovered that the band frequencies got further and further off as I rotated the band dial. I scratched my head and tried again, thinking that I had screwed up something in that RF cage. You’d probably have the same sinking feeling I did (and I was so bloody careful). Turns out that you’ve got to make sure you get the CORRECT peak on those coils. Sometimes there is more than one peak. Pick the wrong one, and the frequencies on the dial just won’t correspond as you rotate the dial. The first time through, I used the first peak that came along, and it turned out to be the wrong one. So keep an eye out for this potential mistake. You can clearly see how difficult to reach some of the paper capacitors are in the RF deck. Many restorers have tacked the problem by publishing elaborate instructions for deconstructing the RF deck. Certainly this approach will work, and it is the preferred one with some early Collins radios such as the 75A-1. 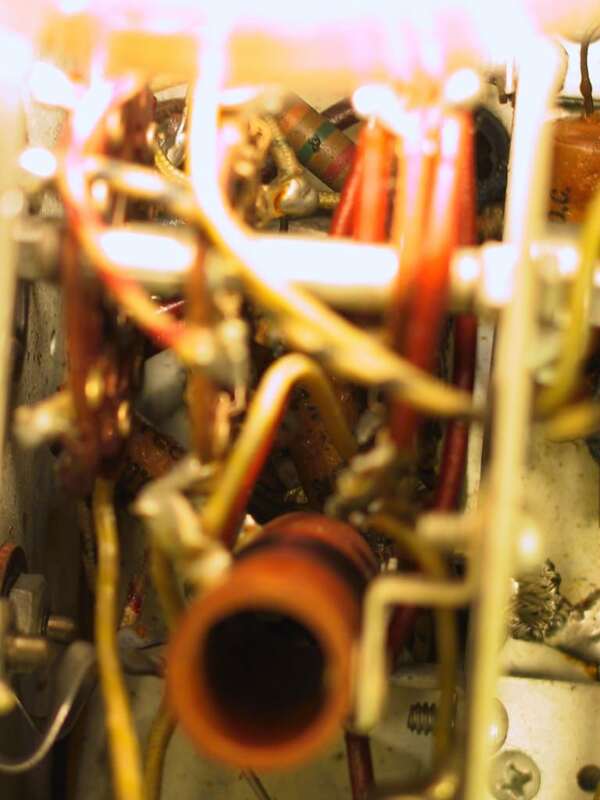 However, if you are careful, you’ll be able to replace every single paper capacitor by removing the fine tuning shaft (the black shaft in the photo above) and then unmounting various trimmer capacitors as required to reach a part. You will need several pairs of good hemostats, with both straight and angled teeth. 1. Be careful around the dial scales when you clean the radio. The material is brittle and the makings are easy to rub off. The paint isn’t even very resistant to water. 2. 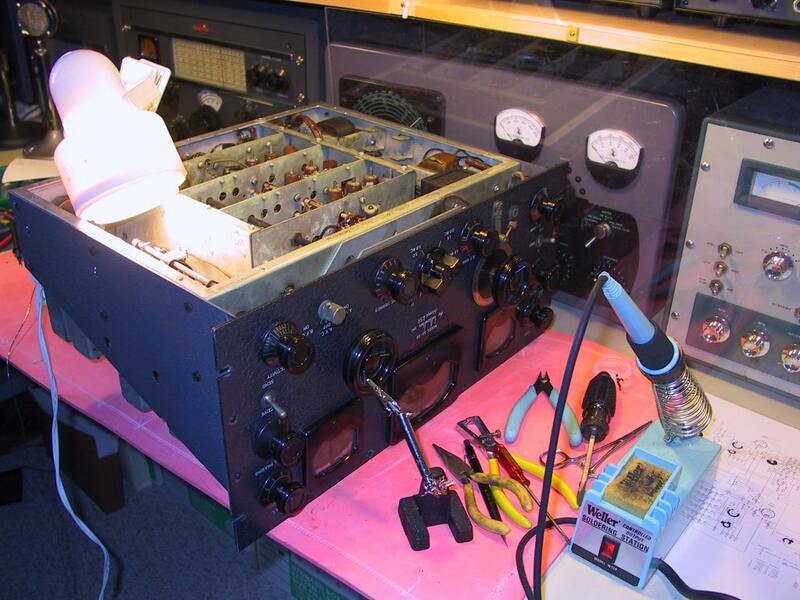 Don’t miss Bill Feldman’s excellent articles in the February and March 2005 issues of Electric Radio titled “The Refurbishment and Modification of my SX-28s” (you can still order back issues of the magazine at the Electric Radio site online). Bill provides a modification to address the radio’s distortion generated by detector clipping. I haven’t done this yet but plan to give it a try. 3. Bill Feldman also shared, with anyone who asked before he passed away a few years ago, an excellent SX-28 Alignment procedure. This is far more detailed than the procedure you’ll find in the manual. The factory alignment procedure is sufficient, but the extra guidance Bill provides is very worthwhile. 4. Pay attention to the AC line cord. You would benefit by replacing it with a 3-wire grounded version. 5. You probably already know to replace all the paper and electrolytic capacitors. Don’t forget to check the resistors as well. A considerable number of them in my unit were more than 25% out of tolerance. 6. 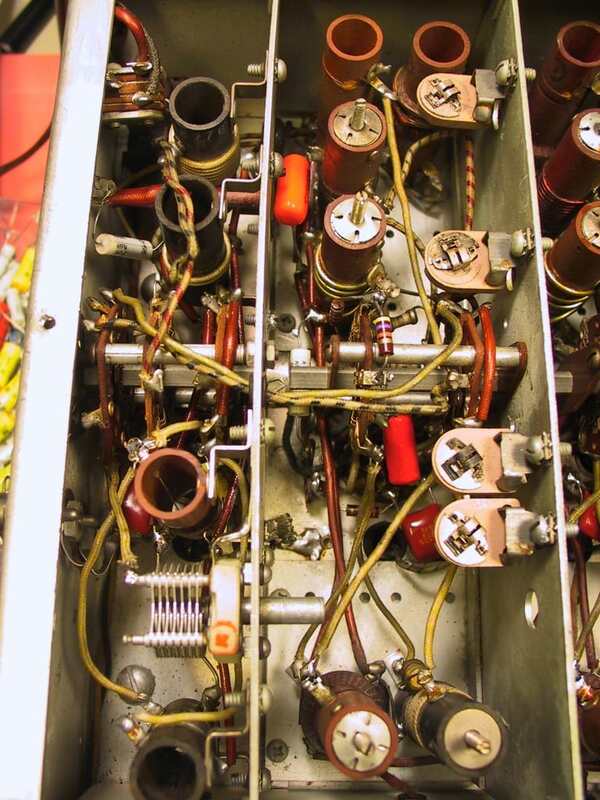 To align the IF section, you will need to connect a generator to a pin 8 on V3, the mixer tube. The pin you will need to connect to is quite buried, so if you’re having trouble, use a short tube extender or wrap a short wire around the pin of the tube and plug it back in. 7. If you find the transformers in the IF section won’t peak properly or at all, don’t forget that there is a capacitor inside the IF can. While these are mica capacitors, they can still drift and so are worth a check if you’re having problems. Can you see the two dark brown paper capacitors buried deep below the bandswitch? Look at the round coil form at the bottom of the picture. You can see a bit of one paper cap at 12 o’clock, and a bit of another at 10 o’clock immediately above that coil. They are nearly in focus if you look at the picture carefully. Amazingly enough, by only removing a wire or two from the bandswitch, you can reach and replace these capacitors. This photo shows the rearmost two RF sections fully restored. 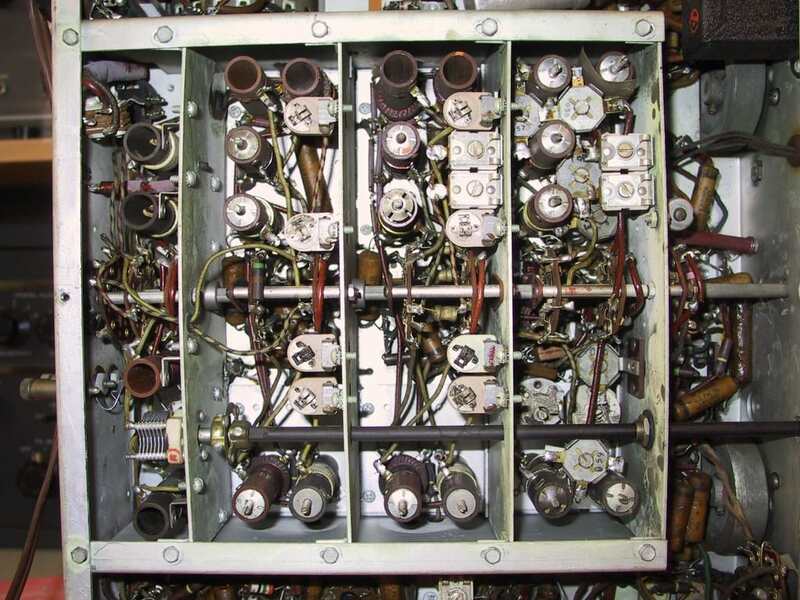 All paper capacitors and out of tolerance resistors have been replaced without the need to go through the more complex disassembly of the RF deck that some restorers have employed. So if you can find one of these receivers, by all means pick it up. Once you’ve restored it, you’ll love listening to its warm sound. John Staples wrote an article about his Hallicrafters SX-28A Reconstruction. Don’t miss it! Wow, your 6th. Great that you’ve got the techniques down, as it can really reduce the time consumed. Removing the RF sections would certainly give you more room to work. I considered it but found that I was able to develop new techniques that allowed me to replace all the caps and resistors without removal. If I was retired and had the time, I’d probably do it your way. Good luck rewinding the antenna coils. I wonder what made them open up. Don’t know what caused the open primaries..There is no evidence of burning…Probably have to get an SX 28 as a spare parts radio..The coil wire is very thin and can’t be handled very well…. I have just acquired an SX-28 that sadly was stripped of all its knobs, except the AGC/BFO knob, by a previous owner. Do you have any knobs for sale from your parts hulks ? I also need the logging scale and dial lock. You can contact me at tom AT cpic.net. I do have a set of knobs. Hi: 12/18/12 — I am working on a SX-28 (not the 28-A model) and the Band 1 antenna coil in the RF section (1st coil in Band 1) it is T-13 — has the bottom coil burned/cooked. Sounds like you have faced that repair in yours. Would you by any chance know the inductance of that bottom coil on T-3? The top two windings are 180 uhy on my T-3. I did not face any problems with T-3. Sounds like your set either took a minor lightning strike OR, more likely, someone managed to transmit into the receiver due to some problem with their switching relay. I looked in the military version of the SX-28 manual, and all it says for T-3 is that it is a 455KC IF coil. You could probably calculate the correct value, at least ballpark, by determining the “effective impedance” that this coil connects to. The coil would be aligned to minimum impedance at the 455KC IF frequency, giving you maximum signal transfer. What makes this more complicated (and the reason I said “ballpark”) is that this is not an air core inductor. The impedance is instead varied by the slug and there is really no way to predict things without experimentation. You could calculate the correct IF value, then remove the coil and rewind it with enough turns to reach the desired impedance with the slug set to it’s mid value. Then try it in the radio. If this is too complex (you do have infinite amounts of time on your hands, don’t you?) you could rewind that portion of the coil by carefully unwinding the coil while counting the turns. When rewinding, it will be important to use wire of the exact same gauge. I’ve used this counting technique with success on several occasions. I hope this helps. Do you offer SX-28 restorations as a service? I have one that I have been keeping for several years trying to get up the courage (see my website). 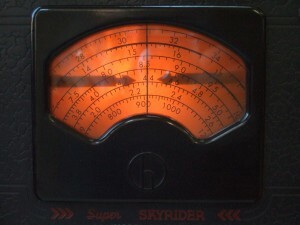 It’s in very good shape and works but the AVC is not working, and with it, the s-meter. How much does an average restoration cost? And if you don’t do restorations for people do you know anyone who does? These things are usually a labor of love for the owner. The SX-28 restoration is very do-able, but it takes more time than most. A full restoration and alignment would take 40 to 100 hours (perhaps more, if an oddball problem was encountered), so it would be impossible to charge fairly for the time spent. There is, however, a directory on the CHRS website of people who repair radios. You could ask them to address the AGC problem you mentioned, but if you don’t do a full restoration, you’re likely to encounter another problem soon. The paper and electrolytic caps in these receivers are all prone to failure at this age. That said, I highly suggest you tackle the restoration yourself if you have the skills. I’m busy, so my restoration took me about a year. The SX-28 is one of my most prized radios. It sounds as good as it looks. Trace the circuit and use a schematic diagram to determine the correct resistor value. Hello Tom, I used to have one of these but my technical skills are not deep enough to do what you did. I am impressed with your knowledge! And patience! By the way, I also had another Hallicrafter’s communication receiver, but this one had in addition to the usual tube lineup several acorn tubes. Could it have been an SX 27? It actually worked. WOW! Beautiful radio you have there. My grandpa had a Knight Shortwave set when I was a kid. I remember him always fiddling with it. These vintage units are really well made and that’s SO obvious with your Hallicrafters, which was a very popular brand name back in the day. With updated components your unit should really work nicely. I’m into the Fisher FM receivers from the early ’60s. Best of luck to you with your really cool Hallicrafters. Do you still have this radio? I’m wondering…Please post reply. Looking for someone near California who can do a restoration on my SX-28A cabinet. I’m down in Monterey. I bought this at the auction earlier this year. Hi All.. I enjoyed reading your posts. Thank you all for the info. My daughter bought an six 28 a at a local hamfest and I am helping her restore it. We just completed replacing every paper cap we could see; and still have about 12 to go. Thank you for the tips!! We completed the recap job, and the sx 28 turned on. The amp works fine but still has some 60 hertz hum we have to find. 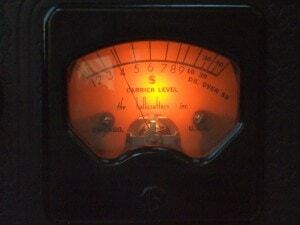 Found some sort of mod in the S meter circuit while looking for the source of our hum. We plan to remove the mod than find the hum. This mod has connections to many locations in the receiver and I am not sure if I have the correct print for the sx 28. Does anyone have any pointers on proving that I am using the correct print. I have a couple of similar prints. I just came upon an SX-28A, unrestored. It works, but it’s missing the louvered, clip-in, condenser cover. Anyone have a source for one ? Keep an eye on eBay and hit the road to hamfestville. The cabinet is a very dark charcoal gray wrinkle finish. Definitely not black. The front panel is darker . . . almost black on mine. Was wandering if there was a clear view of the coils. What does the designation of c mean. Since back in late 1953, I’ve lusted for an SX-28 (saw it in a ’45 Handbook and fell in love). I’m finally picking one up tomorrow. I’ve restored numerous radios, including a TOTAL redo (caps & brand new [not OEM] 5% carbon comp resistors. on a National HRO-60T. Also 3 SX-62s, but this one.. yep, this is the one. Yeah, it’s a real classic. It has more audio distortion than I’d like, but I haven’t yet had time to see what mods would be required to improve it. It appeared to be coming from the product detector. Back when it was designed, they probably didn’t care if THD was 10%. I have an SX-28A I bought 30 years ago that appears to be in good condition to restore. Cabinet, all knobs, bezels, S-meter, dial lock, etc. No obvious Also 3 PM-23 Speakers, and one wooden speaker with the “h”. All with cabinets have Speakers and transformers. Where would be the best to sell these? The other Speaker looks like an R-12. Restoring my first SX28. How do you removed the chassis from the cabinet? The SX-28 is not a good radio if you are doing your first restoration. It is fairly hard to properly recap it, and your question suggests that you should start on some easier radios first. Get some experience under your belt before you dive into a radio this tough. That experience should make it fairly obvious how to remove the chassis in the SX-28. I’m missing the shadow pointers on the main tune dial, any method to fashion new ones? Ebay. You can probably find a parts rig. Are there any old wax capacitors in the RF section nearest the front of the sx28? I’ve replaced 11 wax caps so far from the other 3 a while back and don’t want to HAVE to remove this section if I don’t have to. My SX-28 is in the case so I can’t check. You should be able to see the old tubular paper capacitors with a flashlight. As I recall, every section had some paper capacitors (often they were in black or green tubular plastic cases). Some of them are challenging to replace, but it can be done in a craftsman-like way with some creativity. I just came across your article re restoring an SX28. I have an SX28 that I acquired a while ago and am about to work on it. Since we live close to each other, (I live in Portola Valley) I wonder if we can get together for coffee. I would like to learn from your experience. 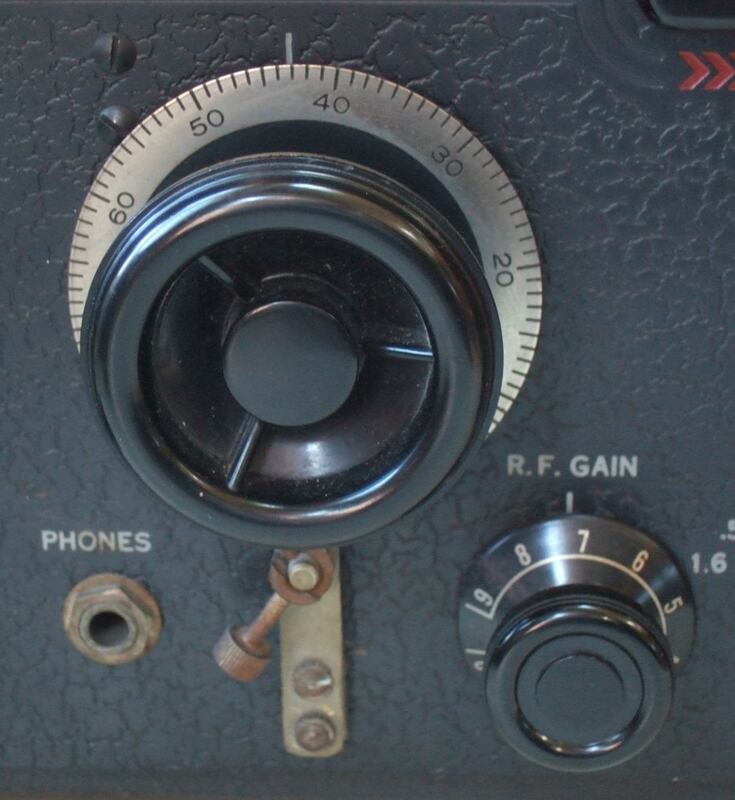 I have restored a few WWII era radios, including an ART13, and wrote an article in ER. I have also replicated the Paraset from scratch, about which I wrote for CQ. Would be great to meet you. Contact me offline at k6adtom AT hotmail.com. Are you a CHRS member? You’ll find lots of like-minded people and we’ve got a radio museum under construction in Alameda. We bought the building two years ago There are many ham and military pieces that will ultimately be on display. I am in Oakland and have a nice SX-28. I just want it working but have ZERO electronics experience. Anyone who would be willing help would be GREATLY appreciated. I am afraid of ruining this thing. Consult the Repair Directory in the Restoration section of the CHRS website. You will find a good selection of qualified people. Many, many hours would be involved in restoring one of these properly, so be prepared to pay handsomely. Hate spell check!!! The call was W2PH or HP not sure as I was wetting myself! 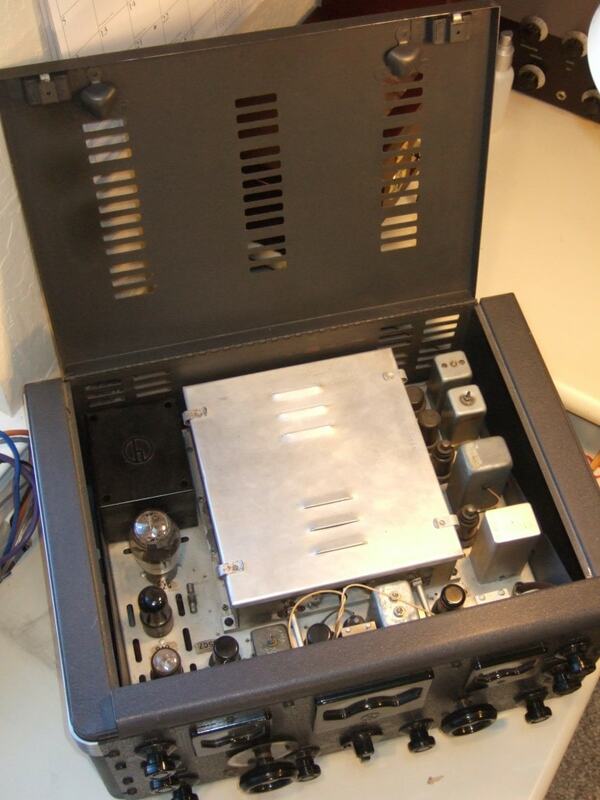 I’m restoring two SX28 receivers presently, an SX28 and an SX28A. I have to replace the wiring for the IF transformers as well as for the Lamb noise circuit. But the colours are quite degraded, the insulation has crumbled, making rewiring and reinstallation of the transformers challenging. Does anyone have any documents showing what the factory original colour coding of the wires is and what their function is? Thanks and 73s. The colors were pretty much degraded to browns and yellows in my unit, too. I’ve never seen any documentation of the colors used. Probably the best way to do it is to ohm it out on the chassis and then follow the schematic when rewiring as best you can. Or perhaps you could find another unit to help answer your questions as you go along rewiring. Wish I had some better suggestions. How would I go about selling a Hallicrafter SX 28? I’m in Maine and bought it from an amateur radio operator who was the origional owner. Ebay, Craigslist . . . . . . . . . I am excited about your restoration of the SX-28 Hallicrafter. My bottom of the device looks exactly like yours. I find on the Internet no adjustment instructions that fits on my or your name of the trimmer bottom. Can you please send me your adjustment to your device? I’m glad you found the article useful. To align your SX-28 you will need a full manual. There’s really no way to do it without the factory procedures. I suggest you purchase a manual. They can find them on ebay for as little as $9.